So anyone who has read anything I’ve written knows I am battling a fish. Not the great white whale or the Hemingway’s epic catch, but a fish of my own size, an identity crisis. Call it a spirit animal. It’s the cornerstone of most of my university poetry and held me back from some powerful conclusions in previous work. Like most things, the fish itself was more an idea than a conversation, so it was hard to break from when this editing project came about. However, I will still attempt to kill the fish. This poem was part of a larger collection that involved ocean and sand as a two separate home places where the speaker (me) was torn between them, longing for this perfect ocean situation that was impossible because I was not, in fact. a fish. It was more an identity issue than anything else, which is flat. 1. a map there are so many places to go with a poem, but first you need some kind of idea what the landscape looks like. This poem, for example, needed more umph, but before I did that I needed to decide if this is about me or something bigger… and I in a neighborhood or a highway? This is the setting zone of the poem, the outline. 2. a compass, preferably an old fashion one with the rose all flourished and lovely. So I’m on the highway, great, but I could get really lost if i start due north and my ideal destination is south. So, was this poem about going towards the sea or away? This is the speaker’s direction, or the narrative of the poem. 3. some wheels. This one seems silly, but it’s really the most important. On the highway, headed south, am I in a bike or in a car or in a truck? The pace, or the speed of the poem makes the most difference. Before, the pace was a fly by. First I was on the beach, then I was far away, but here I’m on the boat, feet in the water, falling (or diving) in–minute to minute, no rushing. My wheels here are a bike… and while I would never want to be on a bike on a highway headed south, it makes this poem more readable. This poem has potential, not finished left, but has some more hope once I threw the fish back in the bay. Falling for a sea siren makes for a much better story than a lost fish with no hope of a true identity. 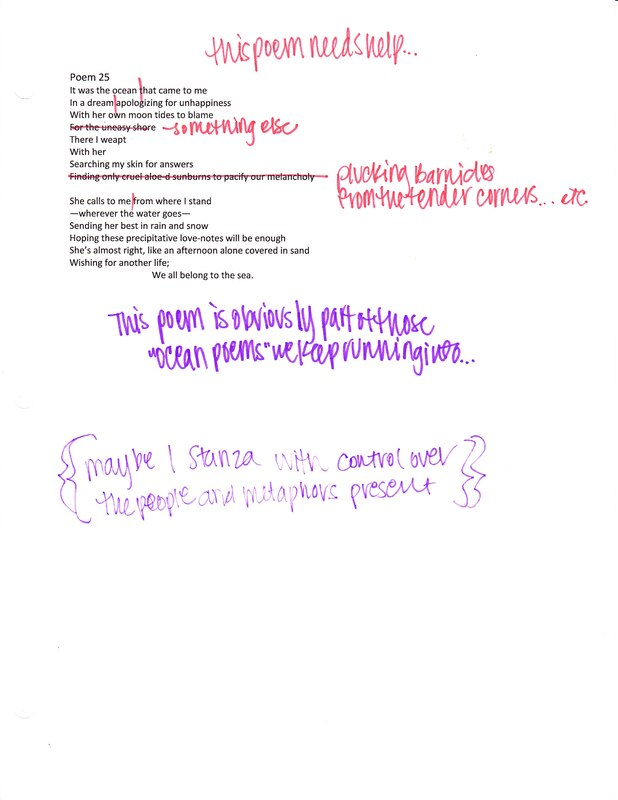 There are lots and lots of ways to fix a poem that needs help, just keep in mind where you are headed, in which direction and at what speeds. That way you’ll always know where the best changes can be made, and if you need to turn around and start over from there!